As the work environment has evolved and jobs look more different, it is important to understand the impact of these changes on income—predictability, variability, and frequency—and how this affects the opportunity for mobility. Because of the complexity of income volatility, there is a unique role for philanthropy. AFN’s latest brief, Income Volatility: Why it Destabilizes Working Families and How Philanthropy Can Make a Difference, was developed to help grantmakers understand the enormous challenges income volatility presents in America and provides an array of strategies for philanthropy to leverage both investments and leadership to empower families to protect themselves from volatility’s worst effects. This brief is based on research from EPIC (Expanding Prosperity Impact Collaborative), an initiative of the Aspen Institute Financial Security Program, which investigates economic forces that severely impact the financial security of American families. Grantmakers, nonprofit service providers, employers and policy makers were invited to Join Asset Funders Network for a webinar on November 29, 2017 as we focused on the changing nature of work. 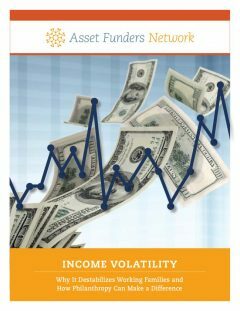 In this webinar, we discussed how income volatility challenges working Americans and we explored emerging strategies to address income volatility and economic insecurity through workplace advancements. Speakers included Ida Rademacher, Aspen Institute; Don E. Baylor, Jr.; The Annie E. Casey Foundation, Kimberly Ostrowski, Prudential Foundation; moderated by Leah Mayor, Asset Funders Network.